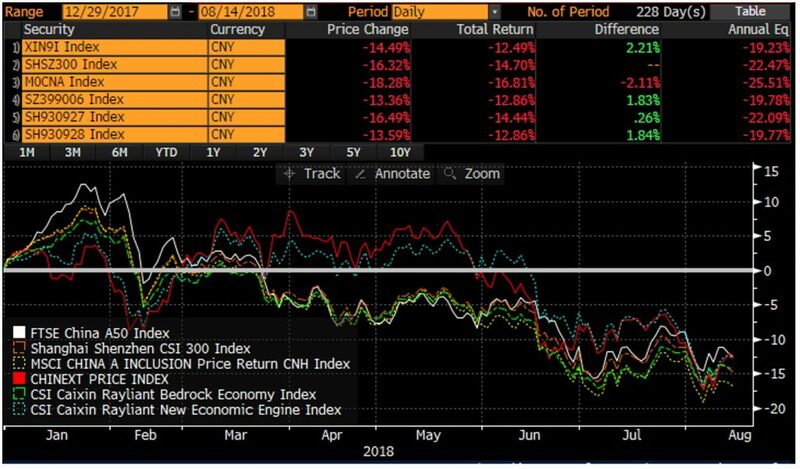 China markets’ move down YTD has raised a lot of questions for Emerging Market investors, particularly given the MSCI China A inclusion earlier this year (and again in 2 weeks). But is the move down driven by a macro growth story threat, company fundamentals deterioration or a more general risk-off move amid trade war uncertainty. 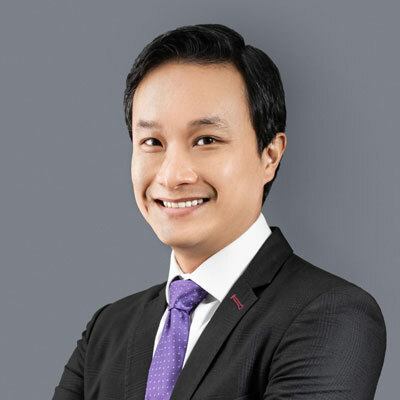 Our CIO, David Lai, offers his point of view on events so far and explores the potential path from here. Internal: deleveraging, default risk, a slowing economy and strong capital controls are the major tone. General macro indicators like CPI, exports and PMI remain stable except for FAI from SOEs. External: trade war and EM currency moves are wild cards that may have spillover effects. Inflation: July CPI was at 2.1% from 1.9% in June and core CPI stayed at 1.9%. PPI fell to 4.6% from 4.7%. Rising food and non-food inflation were led by pork and energy. Lower manufacturing offset higher mining/materials PPP inflation. A mild inflation outlook is expected in 2H, with some modest upside risks – still benign and leaves room for monetary easing. Leverage: July new RMB loans at RMB1450b was significantly ahead of market expectation, with outstanding loans up 0.5% to 13.2% yoy. Outstanding aggregate financing moderated to 10.3% yoy in Jul versus 10.5% in June, driven by further contraction of trust loans and entrusted loans. 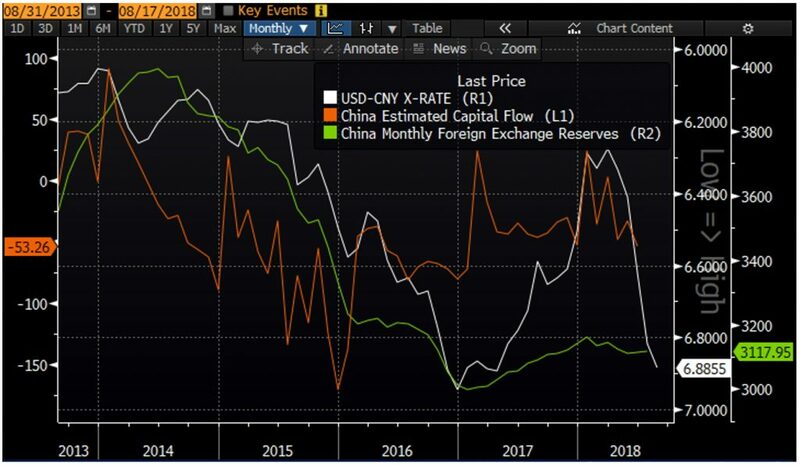 Reserves: China's unexpected rise in July FX reserves suggests capital outflows are not yet evident. Slightly higher capital outflows may be seen later in the year given the recent CNY weakness. Investment: The economy is slowing down due to relatively tight policies on shadow credit in the past six quarters, which inevitably hurt small businesses. Rising trade tension started to hurt confidence, but not much impact on retail consumption and exports so far. Fixed asset investment rose at 5.5% - the slowest pace in two decades. 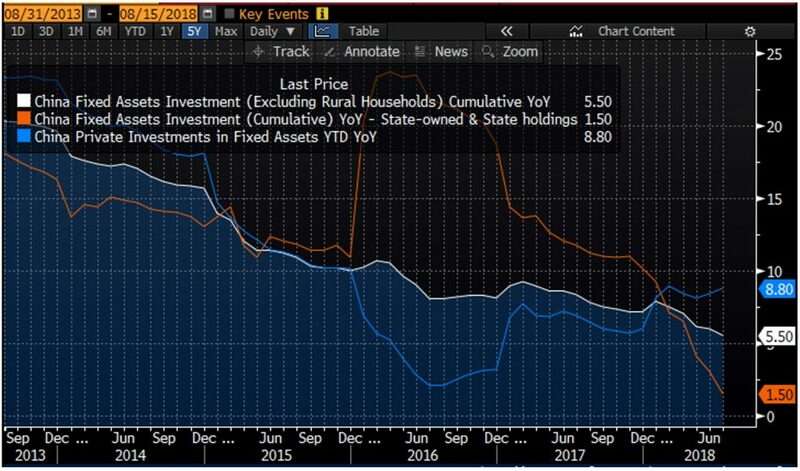 Interestingly, investment by state-owned enterprises fell sharply from 9.2% at the beginning of this year to 1.5% in July whilst investment by private enterprises held up very well with 8.8% in July versus 8.1% at the beginning of this year. 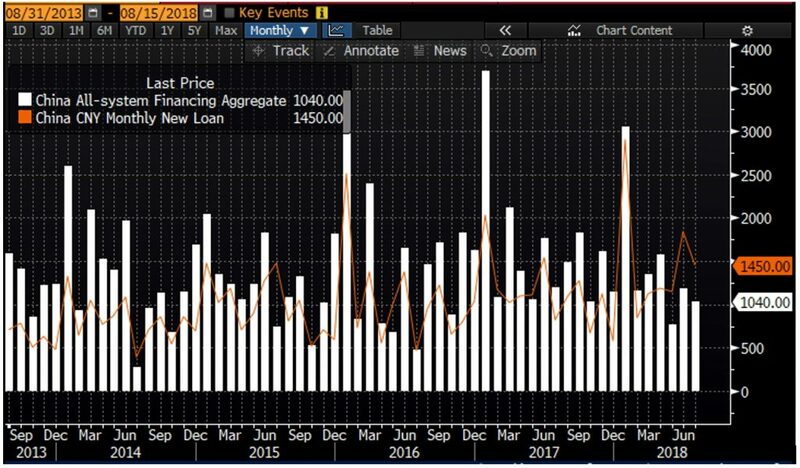 Borrowing Rates: PBOC indicates that 2Q average rate was 5.97% (0.01% higher than 1Q), with financing costs for general loans and mortgage loans both rising and slightly offsetting moderation in bill financing costs. Loans priced above benchmark rose 0.9% to 75.2% (highest since 2004) whereas those below were only 24.8% (-0.9%). This borrowing cost increase is the result of the deleveraging drive. Although Beijing is rolling out more stimulus, its impact will take time, potentially leading to a slower GDP growth in 3Q: 6.4% yoy vs 6.7% in 2Q. Turkey: Lira’s slump may fuel volatility in emerging-market assets and dampen investor sentiment in the near term, as markets are already skittish. The latest plunge in the South African rand and Russian Ruble were symptoms of the growing contagion in emerging market currencies. The widening current account deficit in Indonesia added to concerns as well. That said, investors were already cautious about emerging markets as the prospect of a global trade war compounded concerns about a more hawkish Federal Reserve and European Central Bank. Emerging Market Contagion: The bottom line is that Turkey has experienced a robust credit cycle with debt growth materially outstripping investment. The banking system is vulnerable to capital flight and unwinding of the carry trade due to the build-up of foreign liabilities. Until real rates climb sufficiently for FX reserves to stabilize and inflation to fall, Turkish financial assets will remain under pressure. The risks of EM equity contagion are not high though. Firstly, outside of South Africa and Argentina most EM countries are running small current account deficits or are outright positive. Secondly, foreign ownership of Turkey’s bond market is only 20%. 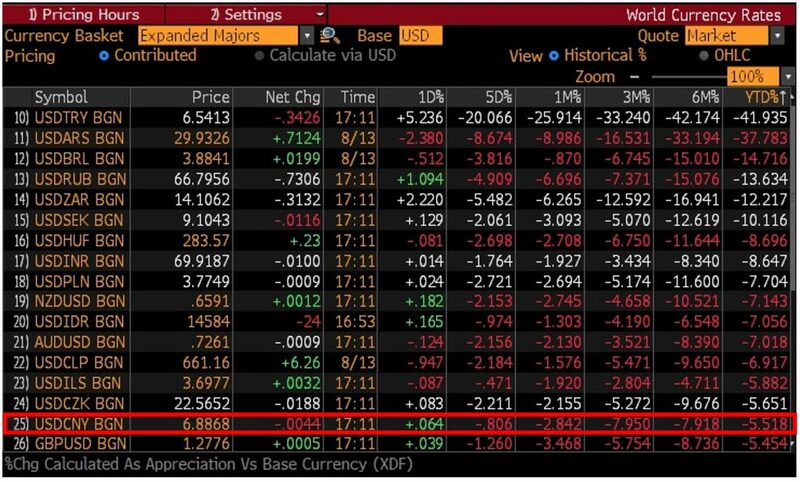 If they were to default it would hurt credit markets, but it would not be as bad as if South Africa did such an event (40% ownership). Thirdly, Turkey’s exports are centered around Europe. The worst-case scenario for equity investors is probably some form of capital controls by the Turkish central bank. China-A was not performing well initially this year due to tight liquidity and then was dragged down further by the ongoing concern around trade war and RMB depreciation. Sector wise, healthcare outperformed with Telecom/IT/industrials lagging. Among different segments, mega caps and ChiNext stocks outperformed both mid-caps and small-caps. Among indices, CSI 300 and MSCI China A Inclusion indices underperformed the FTSE A50 and the CSI Caixin Rayliant indices we use for our ETFs (2803 HK and 3173 HK). Valuations: Overall, valuation is decent as most stocks are trading below the early 2016 trough when CSRC tried to introduce a circuit-break mechanism, with the notable exception mega caps. For example, Bedrock is trading at a forward P/E of 9.8x versus CSI300’s 11.1x and MSCI China’s 12.1x. For dual-listed shares, A shares are trading at only a 16.5% premium over their equivalent H shares listings, versus a premium of 30%+ at the beginning of this year. 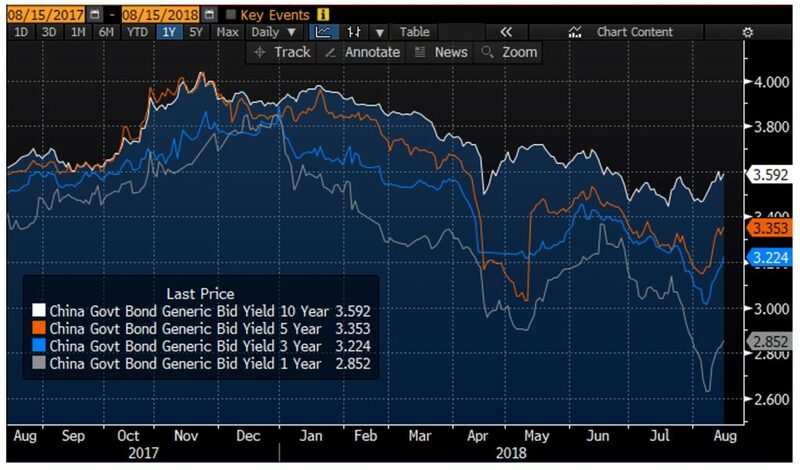 Rates: The drop in domestic government bond yields across the curve is a good example of the market’s risk-off mode in equity markets and low-quality corporate bond markets. Money is clearly moving back to safety. Peer-to-Peer Lending: the P2P crisis reflects tight liquidity/control onshore. China’s booming fintech industry, once seen as a golden investment opportunity, is being challenged by a massive wave of defaults by peer-to-peer lending platforms in recent months. Since June, more than 200 online microlending sites have shut down, and many of the founders have gone missing. The P2P scandal reached its zenith on August 6 when thousands of petitioners, all claiming to have suffered losses from the closure of online lending sites, gathered around the China Banking Regulatory Commission in Beijing to urge the government to take action and recover their money. Cautious with few catalysts in the short-term. Limited downside in both equities and CNY from here. Policy is likely to be accommodative within limits, still leaning to deleveraging long-term. Equities Overall: Bearish EM sentiment may last a few more months until the US mid-term elections in early November. The market is currently driven by negative news and rhetoric rather than fundamentals. Few investors are making any strategic allocation decisions for the medium-term. Digging deeper, one may find that China’s relatively strong among EMs on currency and current account. RMB is not even one of the top 10 worst performing currencies year-to-date – both Australian dollar and New Zealand dollars dropped more than RMB. That said, there are no catalysts on the horizon for China markets to move higher in the near-term, based on our conversations with fund managers in the region. Given that China A is already the worst performing market with a decent valuation, further downside is likely limited unless we are facing a crisis similar to ’97-’98 or ’07-‘08. A short-term positive would be the 2nd round of MSCI inclusion on 31st Aug. Stimulus: Investors may stay cautious on the equity market due to higher risk of tariffs and potentially weaker stimulus. However, stimulus remains the focus as NDRC is trying to increase local government investment appetite for existing projects while exploring new funding channels. Some banks are reported to have loosened loan granting to infrastructure projects. FY18 Railway FAI target may be raised to Rmb800bn, ~10% above the original plan. It may not be an optimal solution, but Beijing will step up credit easing and fiscal measures to deliver a recovery and prevent financial troubles, such as a further rise of bond defaults. 1997 repeat: Some investors are wondering if the environment is like 1997, when the US market was at the beginning of the TMT bull run which later evolved into the Dot.Com bubble, yet at the same time the Asian Financial Crisis happened in 2H97. While some similarities in market conditions (US economic upcycle, strong USD and debt issues in EM) are here now, Asia is in a much stronger position to withstand the pressure given much better and rational fiscal conditions. RMB: Unlikely to depreciate significantly from current levels, though it may test the level of 7.0, which would equal the magnitude of depreciation that happened between 2015 and 2016. We do not agree that any depreciation will help exports as Trump can always increase tariffs while other export countries may compete for depreciation. It’s more important for Chinese officials to consider the impact on capital outflow and outstanding USD debts. Policy: Fiscal policy is likely to be more supportive in the second half of 2018. Is China postponing the deleveraging process given the more accommodative monetary policy? In other words, would China switch gears and look for more pro-growth policies? Our view is that deleveraging is likely to continue, albeit with some fine-tuning toward growth. Notably, several government ministries jointly issued guidelines on Wednesday, indicating their policy priority by detailing the reduction of domestic enterprise leverage. The inter-bank market is flooded with liquidity right now, reflecting the current policy mix. Commercial banks are still cautious to extend credit to corporates, especially private firms, as continued deleveraging could result in more defaults. However, easier monetary policy has dramatically improved market liquidity conditions. 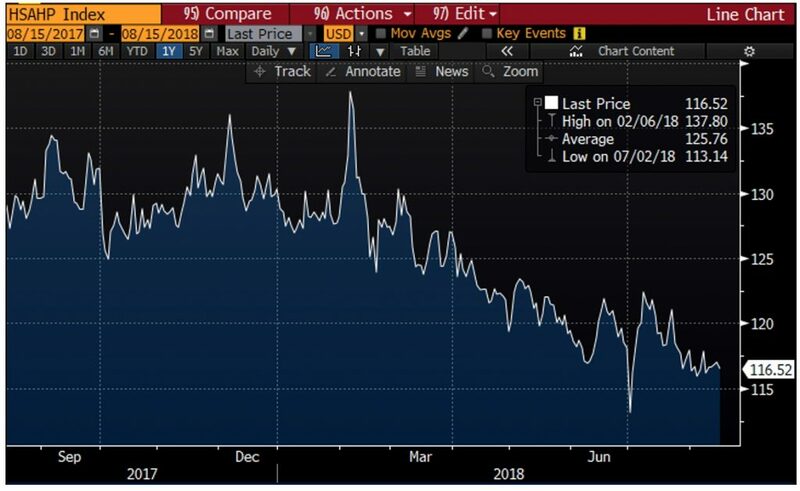 As we mentioned above, government bond yields have fallen significantly in the past few months as banks moved excess money to safe-haven assets. Hence, monetary policy easing may have a limited effect in boosting the real economy. Assumptions: (I) No melt-down in RMB exchange rate; (II) Default of China debts is controllable; (III) No full-scale EM crisis, leading to a complete risk-off mode; (IV) Trade war tunes down after the mid-term election in November.